Before breaking out the wireframe sketches and paper prototypes, some back-to-paper web types get the juices flowing with mind maps and sketch notes. Then they blog about it. Mike Rohde is kind of the king of these. 37Signals recently posted his sketch notes from the Seed 3 conference and they’re a pleasure to read. He’s done the same for SXSW, VizThink workshops and other web watering holes. Collect them all. Paul Downey was inspired by Rohde to sketch-note FOWD London 2008, above. 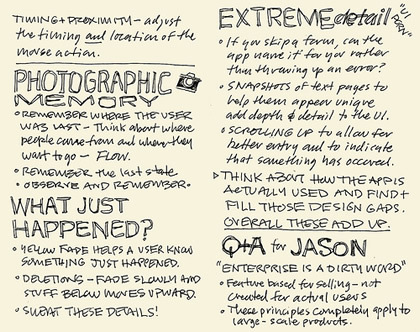 View the full size on Flickr and the sketch notes are even better with notes. 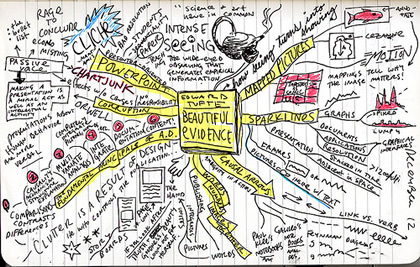 Austin Kleon creates mind maps of the books he reads when he’s not blacking out words in newspapers (for a book). Above, his takeaway from Edward Tufte’s Beautiful Evidence. As someone who keeps a filing cabinet full of old notebooks and sketchbooks organized by year and topic (if only I could tag them), I never tire of these web-head hand styles or their graffiti counterpart. 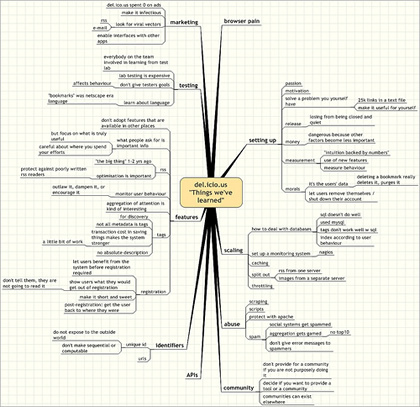 But sometimes you need some mind-mapping software to get the job done. 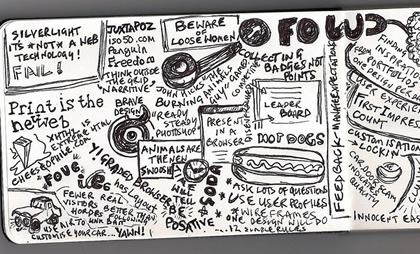 Lars Plougmann’s digitally rendered mind map above of Joshua Schachter’s 2006 Future of Web Apps talk contains a lot of relevant information. Check it out full size. And if you don’t think any of this paper stuff is useful, consider Bill Westerman’s paper-based time management software. Or Adaptive Path’s sketchboard technique.